Biosynth has added two significant new products to its range of new generation AquaSpark™ chemiluminescence probes for research and diagnostic applications, with new features for ultra-sensitive enzyme detection. The new AquaSpark™ alkaline phosphatase (AP) substrates are suitable for immuno-blotting (Western blotting) or nucleic acid blotting procedures (southern and Northern blotting) using AP-conjugated detection molecules. Like other AquaSpark™ probes, they offer strong advantages in being able to work as single agents with higher efficiency and sensitivity over currently existing probes, especially designed to work under physiological conditions and to be used ex-vivo and in-vivo. Again developed in collaboration with Prof. D. Shabat and his Ramot team at Tel Aviv University, the new AquaSpark™ AP substrates are strong emitting dioxetanes for alkaline phosphatase detection, ideal for applications in enzyme linked immunosorbent assays (ELISA). Like all AquaSpark™ -based substrates, they are superior to traditional dioxetanes in being able to work as single reagents with no need for enhancers, co-substrates or any additional reagent. When combined with hugely superior luminescence, this allows the new AquaSpark™ alkaline phosphatase substrates to deliver easier experimental set ups and more robust results in both ELISA and Western Blot immunoassay testing. With two product options, customers are given the freedom of choice in being able to trim assay setups in the most cost-efficient way by using a dedicated AP substrate (A-8164_P00) or reaching out for a more versatile broad range AP substrate (A-8163_P00). Both products deliver tangible user benefits. Simplicity and ease of use: No phenolic enhancer, oxidant and co-factors are needed, as it is the case for luminol-based procedures. More robust testing: enhanced chemiluminescence delivers more observable and reproducible results. Wider detection range: AquaSpark™ phosphatase substrates exhibit a linear relation of AP-coupled antibody to chemiluminescence signal over a very wide concentration range, enabling sensitive immunoassays from very low to high antigen concentrations in the same assay. Value for Money: Unlike chemiluminescence substrates APS-5 or AMPPD, Biosynth AquaSpark™ alkaline phosphatase substrates do not require enhancers such as Emerald or additional luminescence dyes such as lucigenin. Combined with competitive pricing, they can considerably reduce the costs of chemiluminescence-based assays. AquaSpark™ phosphatase substrates are designed for the most sensitive ELISA and Western blot detection methods. Enzyme linked immunosorbent assays (ELISA) tests are based on the highly specific antibody-antigen recognition as well as on a robust enzymatic detection system. Today, ELISA is the most widely used immunoassay format because it combines many advantages such as low costs, high specificity, direct result readings, and antibodies are commercially available for a great variety of proteins or antigens. The ELISA method is now the most widely used format in clinical diagnostics, environmental monitoring, food control and frequently used research laboratories as well. In ELISA, the AquaSpark™ phosphatase substrate solution is applied to the test at the last step of the procedure. Green light is emitted immediately if AP-conjugated (secondary) antibody is bound to its corresponding detecting (first) antibody. (Figure 5) The AquaSpark™ luminophore produces a far stronger light than previously experienced in bio-assay, with a bright green chemiluminescence signal than can persist for minutes or even hours. This luminescence is detectable with a luminometer (microplate reader with chemiluminescence capability) or on film and is impressively visible even to the naked eye. AquaSpark™ phosphatase substrates are compatible with the commonly used protein immunoblot (Western blotting) equipment and detection systems, allowing normal film or luminescence reader to be combined with superior substrates to get the most out of experiments. 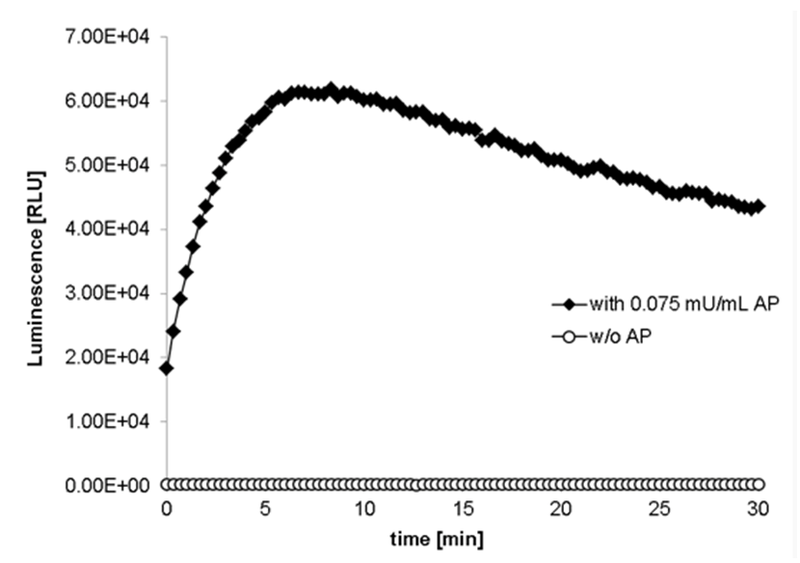 In Western blot procedures, the AquaSpark™ substrate working solution is applied directly to the surface of a nitrocellulose membrane, then the luminescence emission is measured using standard equipment. Click on AquaSpark™ Phosphatase Substrates for more information. Click on Biosynth Downloads to learn more about chemiluminescence, bio-luminescence and dioxetanes. Click on Product Information to view the AquaSpark range in the Biosynth store, with attractive introductory prices. 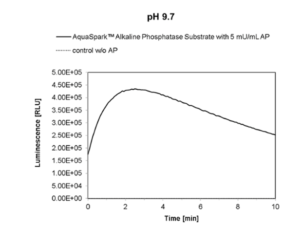 (Figure 2) AquaSpark™ Broad Range Phosphatase Substrate (A-8163_P00) works under pH conditions from pH 6.5 to pH 9.7, distinguishing it from AquaSpark™ Alkaline Phosphatase Substrate (A-8164_P00) which performs best at pH value 9.7. 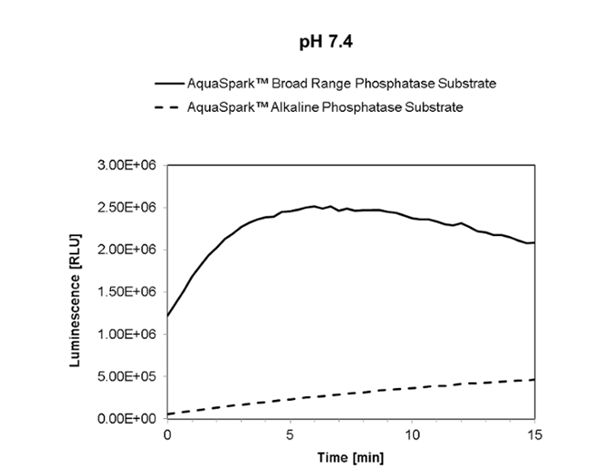 (Figure 3) Wide detection range of AquaSpark™ phosphatase substrates: The light signal corresponds directly to the phosphatase activity with a linear relation of AP-coupled antibody to chemiluminescence signal over a very wide concentration range. This enables sensitive immunoassays from very low to high antigen concentrations in the same assay. 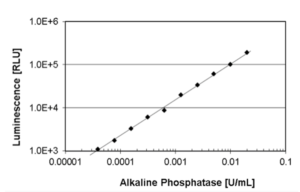 (Figure 4) In ELISA, AquaSpark™ Alkaline Phosphatase Substrate is added and immediately converted by the enzyme to produce a detectable light signal. 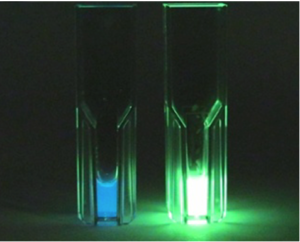 (Figure 5) Comparison of the luminophores: Light emissions of a conventional dioxetane-based probe (left) and AquaSpark™ probe (right). Performed under optimized conditions for both probes. 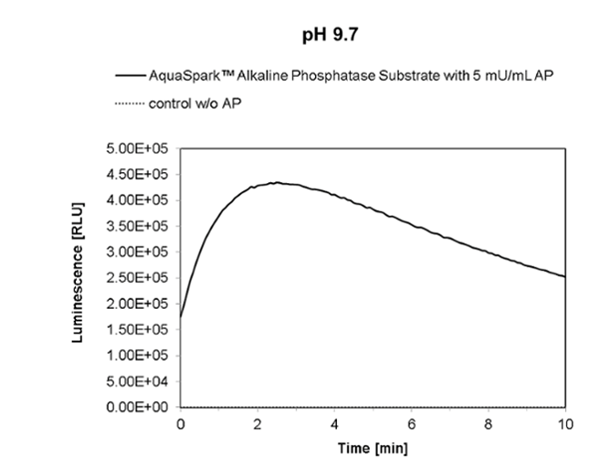 (Figure 6) AquaSpark luminescence persists over time: this test mixed solutions of 10 µM AquaSpark™ Broad Range Phosphatase Substrate (Cat. No. 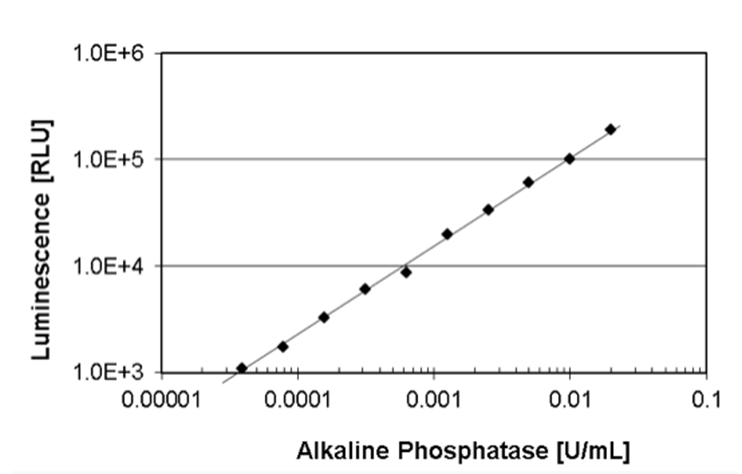 A-8163_P00) with 0.075 mU/mL of AP (calf intestine alkaline phosphatase ) or with Tris buffer (w/o AP). Maximum light levels were reached immediately after activation of both of AquaSpark™ Broad Range Phosphatase Substrate and high light emission persists for 30 minutes. The very low background luminescence of this substrate enables beautiful Western blot images with minimal background. 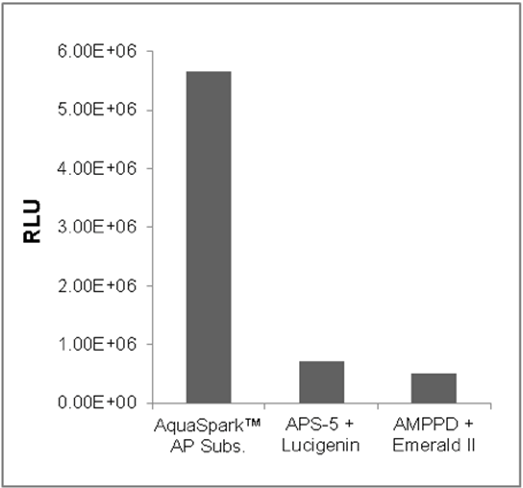 Comparison of the chemiluminescence emission of AquaSpark™ Alkaline Phosphatase Substrate (Biosynth Catalog No. A-8164_P00) , APS-5 and AMPPD. 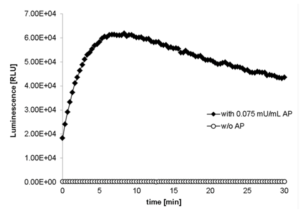 Measured one minute after the addition of 0.6 units/mL of calf intestine alkaline phosphatase. Performed at pH 9.7 using 10 µM of substrate. 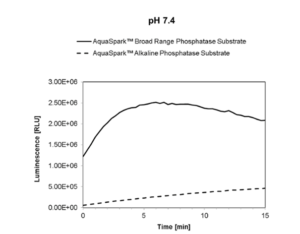 Wide detection range of AquaSpark™ phosphatase substrates: The light signal corresponds directly to the phosphatase activity with a linear relation of AP-coupled antibody to chemiluminescence signal over a very wide concentration range. This enables sensitive immunoassays from very low to high antigen concentrations in the same assay.